The Lone Sparksmen explore the old legend of Buckskin Joe and Silver Heels on their first paranormal investigation. So it seems the paranormal bug has spread like wildfire in these parts. 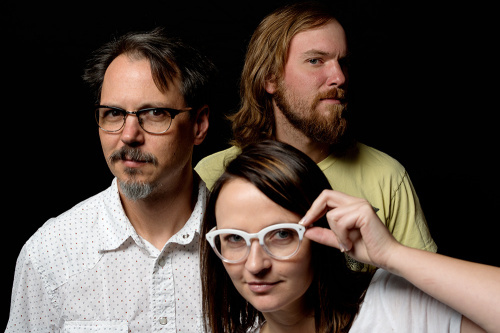 Well, at least amongst three people I've become quite fond of here in our SparkFun community -- Mary, Brendan and Pete. In more recent months, they've all at some point expressed interest in my strange vehemence for the paranormal. Whether by fate or circumstance, a name for this group of people has been born. I present to you The Lone ~~Gunmen~~ Sparksmen! Yes, you read that right ... THE LONE SPARKSMEN! Oh c'mon, you knew this day would come. 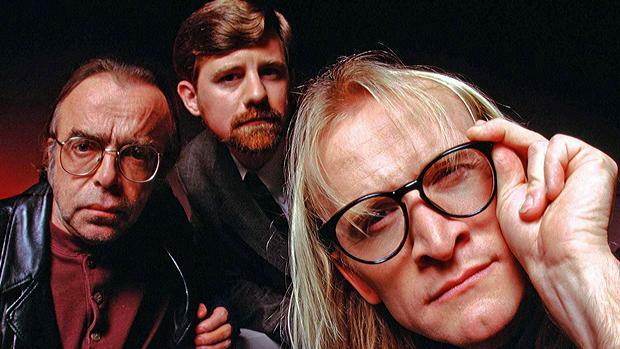 My fantasy of being the female Fox Mulder, aforementioned in my previous posts, would have never been fully realized unless at some point I acquired my own version of "The Lone Gunmen." So a few weeks ago Pete (aka Melvin Frohike) wanted to talk to me about a paranormal device he created awhile back. At the time, he caught me in one of those "all hope is lost" moments. He mentioned to me his idea to potentially pick up Electronic Voice Phenomenon (EVP) via a large coiled antenna. Well, to be honest, he didn't say it exactly like that, but it was something along those lines that had me yelling "Hell, yes!" in my head in response to every word coming out of his mouth. I did keep my composure, though, and for anyone who knows me that is really hard to do when it comes to anything paranormal. Pete, being the incredibly awesome person that he is, did end up making the design, as demonstrated in the video at the end of this blog post. Not only that, but we got the opportunity to test it out during our department retreat two weeks ago. You might ask, "Elizabeth, what kind of department retreat was this?" Well, one where I got to have my very first paranormal investigation with the Lone Sparksmen! Don't worry, it was all captured on video for your viewing pleasure. So what did we investigate?! 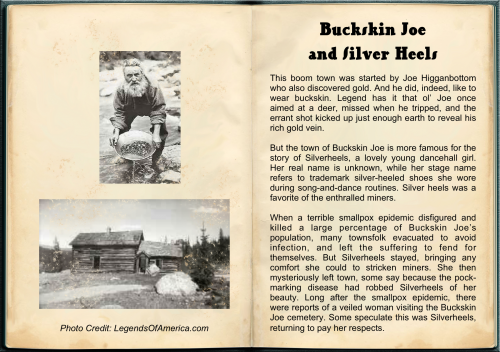 Brendan (aka John Fitzgerald Byers), I've found, has quite a knack for history and told us the story of Buckskin Joe and Silver Heels here in Colorado. Some sources say that you may be able to see the ghost of Silver Heels by visiting Buckskin Joe Cemetery (Alma Cemetery). Now, I will say unfortunately, we did not come across Silver Heels during our investigation. Maybe she doesn't hang around during the daytime, but I can't tell you how many times I've been asked why we never investigate during the day. Well, why not do just that? So we took our equipment and headed up to the old cemetery in search of Buckskin Joe and Silver Heels. We ended up contacting someone ... or something ... else in the process. Thanks for your comment. Mary here. You are seeing much less than what actually happened, what was investigated, and how we are processing the data collected. We are using the known tools from our day to day testing and development atmosphere but we have also designed new tools like the "E-box" developed by Elizabeth and neural network based algorithms for adaptive audio signal processing written by myself. We use the tools currently in the Ghost Hunting community because that is what there is. Soon, we will have new tools as we are inspired to create them and learn from our mistakes. And you are absolutely right. There is still an infinite amount of unexplained/undiscovered phenomena in the universe. We have known about electrons for only a 120 years which is 0.0595% of the time humans have existed. I willingly venture into the "fringe" because that is where new discovery can take place. A place to generate ideas, test them and create theories. Einstein's theory of relativity was considered fringe so heck yes I will go there. The quest for proof of alien life, which is as fringe as ghosts, has advanced Astronomy and Physics. I motivate electrons through a path of my own design for a living. That seems weird to me sometimes. But I understand it now because of the work done over the last 200 years. That being said, I definitely do not want to give credibility to the current tools or encourage the "orthodox science" methodologies as seen on paranormal websites and some reality TV shows. Some go so far as to say Einstein's theory of Conservation of Energy proves the existence of ghosts. No. Nothing so far has proven the existence of ghosts, aliens, other-dimension beings or angels and demons. Does that mean we can't believe? ( I want to believe <insert laugh>.) Or that we can't use these experiences that drive us to further our knowledge of electronics and our development and design of new technologies? But most importantly -It's all in good fun. Getting spooked and then debunking our experiences is even more fun. Frohike was always my fave. I am honored. We moved into the house we live in now, about 13 years ago. I was 10 years old and my sister was 2 or 3. After we moved into the house there was an eerie feeling going up and down the stairs and in the basement. While we were being babysat, my sister was in her room on the second floor. The babysitter and I heard someone talking with my sister. My sister described him as the guy who built the house in the late 80s. The voice stopped when we got to her room and no one was there. I am a Christian and I believe in God, Jesus, Angels and Demons, and ghosts. I have had a run in with a demon about two years ago, an I kid you not, I was terrified. Edit: I want to add that the eerie feeling went away after that day with the babysitter not wanting to come back. My only experience with anything supernatural was at a civil war fort on the east coast where me and my the rest of our 6 person family all had 10 of our items that use batteries lose all their charge in within minutes of entering the fort. We initially dismissed it as coincidence until we we instructed by the tour guide that the spirits have a thing for discharging batteries and that it was an ongoing problem at the fort. They even had free batteries being given out for medical devices and car battery charging stations! Not cheap ones either the Energizer Ultimate lithium ones that go for $14 fo a pack of 4 AAA's! That's wild! May I ask what fort it was?